I recently had the opportunity to chat with Vincent Carbone, the COO and co-Founder of Brightidea. The company is one of a small group of vendors pitching solutions that help companies link ideation with managed innovation. I was looking forward to this conversation for two reasons, the first being that Brightidea is a successful 11 year old company that has never taken venture financing (I expect that will change) and as it relates to product R&D, especially for digital products, ideation is contributing to the software tools sector becoming exciting again. Ideation has always been a funny word to me… it just sounds made up so let’s talk about what ideation is. To greatly simplify the entire market, let us agree that ideation is the process of innovation that begins with collection and sorting of ideas that result in new products or product extensions, validation of the feasibility of ideas, and then integration into a product development process that culminates in a marketing process to create demand for new or improved products. Brightidea calls this “innovation management”… whatever we agree to call it we intuitively recognize that it is a process that every service and product company engages in. I think it is also appropriate to talk about the distinction between two market segments for ideation products and the distinct requirements that each has. Marketing organizations want ideation that is more appropriately described as a lightweight idea submission and voting mechanism that encourages marketplace engagement, and generally speaking it is also true that marketing driven ideation isn’t primarily concerned with the R&D process even though there is an explicit benefit gained that affects R&D. I don’t think it’s wrong that marketing driven ideation isn’t primarily oriented to R&D because the process of engaging customer and prospect constituencies drives many benefits that don’t require integration of R&D, like customer satisfaction, marketplace segmentation, new customer group identification, and social commerce through product suggestions keyed off idea submission. I think one of the reasons why streamlined idea submission products are emerging inside community offerings is that marketing organizations see the value of these services in the context of a community effort. R&D driven innovation management is by definition more structured and while the front end user experience is identical what is happening in the backend is much different. For starters many industries have complex requirements for idea documentation to meet auditing and legal requirements, which is no small requirement on it’s own. Companies also don’t work around the notion of ideas, they work with projects and the management of projects is highly structured with many data points of action and integration. What begins for many companies as idea brainstorming quickly evolves to a structured process of idea collection, ranking, scoring, and then integration in structured product pipelines where separate process loops interact to manage a portfolio of activities and prioritize according to resources. In short, what starts out as a very simple concept quickly becomes complex because the underlying business function itself is complex and involves many people and disparate activities. Brightidea is clearly capable of handling the product R&D side of the market and their customer list is a testament to their success in doing just that. I am not suggesting that Brightidea is ill-conceived for the marketing driven side of the market but I’m also not convinced that that is where they should compete. One of the most difficult strategies to pull off in any market is straddling a high price point that serves a direct sale marketplace and a lower cost self-service on demand model that is based on the same product. Enterprise software vendors have been struggling with price point spread for the last 10 years, therefore I’d say that if you have a business based on direct sales then you go all in on that and tailor price points and product offerings to support the economics of direct selling. Companies like Salesforce.com are successfully dealing in both markets, direct and self-service, but it’s important to recognize that they didn’t start out focused on direct selling and their early leadership driving SaaS resulted in a wave of highly valuable free promotion that they successfully used to lever up their direct business. I’ve been rambling on in this post about a lot of things not related to Brightidea and the reason I am doing that is that it is important to understand the market context that Brightidea, and others, are operating in. The fact that marketing and product groups operate independent of one another with few points of interaction simply doesn’t have to be that way but each group has unique requirements that pre-position them for different segments of vendors operating in this space. Any company pitching an ideation solution is going to be challenged to straddle marketing and product R&D opportunities, IMO. WebStorm: Idea submission and voting. Switchboard: Scorecarding and routing of ideas. Pipeline: This is project management at it’s core and integrates with tools like Rally as well. 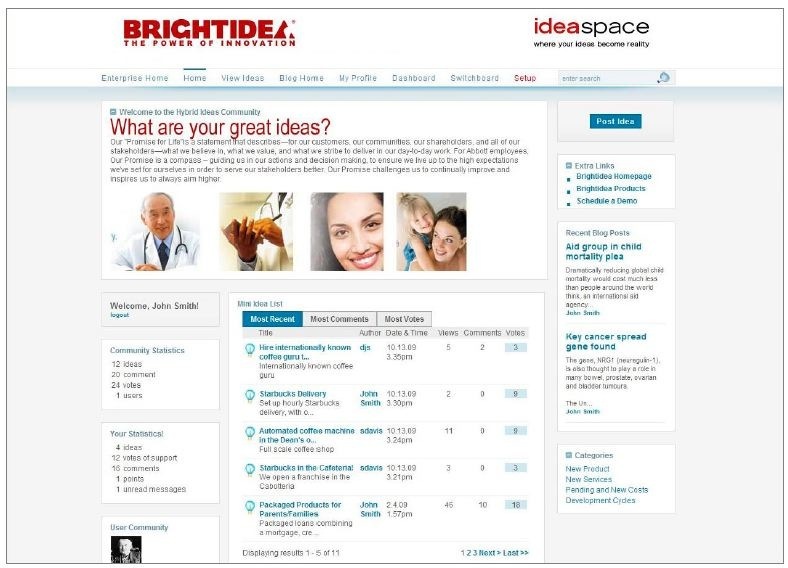 I’ll close by saying that this market is one to watch and Brightidea is a company that has to be on the shortlist for large company selections of ideation tools. Their customer references are impressive as well as the metrics they track to determine the success of the ideas communities that they are creating. Even though this space is early (as if you could say that about an 11 year old company!) it is clear that by any measure Brightidea is a legitimate leader.